Toby D (named after grandmother - great story of how this company came to be after the jump) is a line of limited edition tees with original silk screened artwork by emerging illustrators, graffiti artists, designers, and painters. 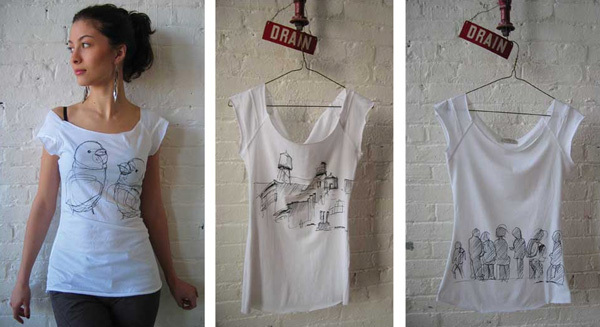 This collection of Doodle Tees are by Ardith Ibanez. These birds, buildings, and people doodles have such a charming quality to them, and the cut of the shirts looks so flattering. How fun a history is that? And i love that picture!